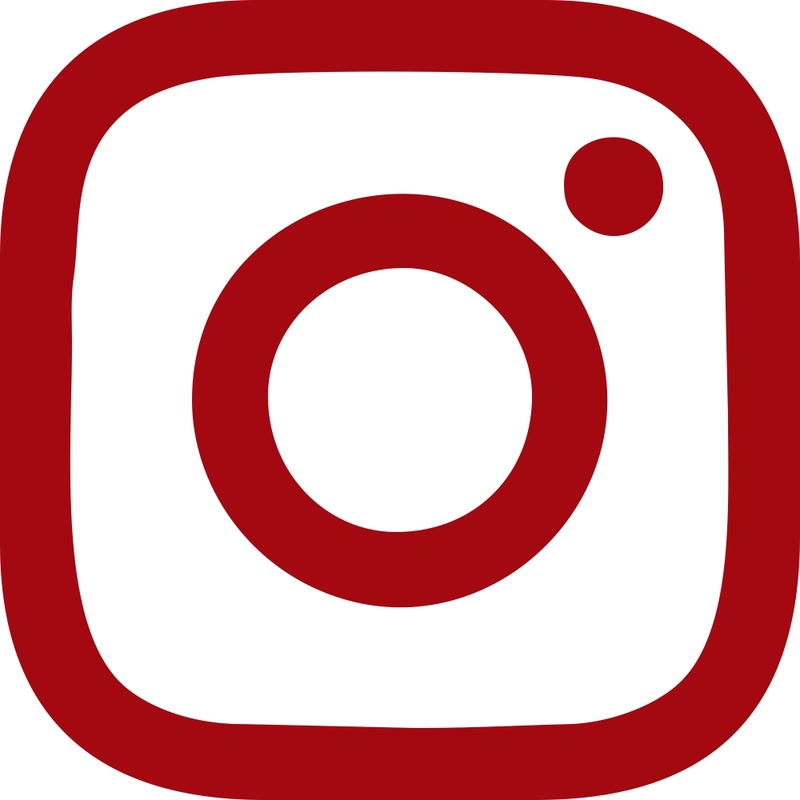 The museum was founded in 1984 and consists of two rooms: where drawings, wooden models, instruments relating to the sundial, reliquaries, illuminated corals are collected. In the sixteenth and seventeenth centuries the current museum did not exist, but in the same year, in relation with the problem of Basilica’s facade, its contruction began. The designs of the various architects, including some famous ones, were collected in a ground-floor room of the residence of the Fabbriceria where they were then framed and exposed. The birth of the museum is to be placed in 1984, in the first room were combined not only the designs but also wooden models, tools related to the tracking of the sundial, some marble slabs of the first half of the sixteenth century and some other objects. The second room was home of the liturgical vestments, relics and sacred vessels and choral miniatures. Between 1958 and 1959 all the material was reorganized and in 1970 the catalog was published. In this room you can admire 16 sliding frames with architectural drawings related mostly to the ever accomplished facade of the basilica. Architects were called in the sixteenth century to give an opinion on the difficult stylish question, almost all adhered to the Gothic style, but without approaching the spirit of the fourteenth-century architecture and had frequent contamination of Renaissance forms. Among these appear sketches by Domenico Varignana, 1518, by Cristoforo Lombardo, Baldassare Peruzzi, 1522, by  Giacomo Barozzi da Vignola in 1545, and two drawings that were for long attributed to Giulio Romano, but of which at least the second was probably made by Andrea da Formigine or his son Giacomo. Others were pianted by Domenico Tibaldi in 1571 and the painting by Francesco Morandi, also called Terribilia in 1580. Architects, such as Palladio, sketched classical architecture, respecting the bottom of the facade already performed (in collaboration with Terribilia, 1572) or tried a “brand new” path. Giacomo Ranuzzi joined the Venetian architectural style as well . Other architects used late Renaissance and Baroque style, such as Alberto Alberti in 1580, or tried to bizzarly combine it with Gothic revivals (Girolamo Rainaldi 1626). The only eighteenth century sketch preserved here is by Mauro Tesi in 1747, but it was a mere scholastic exercise. Here are also preserved these following basilica’s plants: by Baldassare Peruzzi, made in 1522 (a Latin cross with twelve absidal chapels), the two plants by Rainaldi (Four domes or large chapels at the extremities of the transepts). There are also the facade fullfillment’s sketches, performed by Edoardo Collamarini for the competition of 1887 and awarded “ex aequo” with that of Giuseppe Ceri whose model is placed on the adjacent wall. To the chimney’s left there is a drawing surely by Antonio di Vincenzo, first architect of the basilica, depicting the Cathedral of Milan in plant’s construction and the Carelli spire, datied around 1390 and refers to one of the trips made in Milan by the St. Petronio’s Basilica architect. Below there is a stucco model on the wooden table, for the ever-made completion of the Bell tower, according to Sperandio from da Mantova’s project 1490. Under the chimney are kept tools used by Gian Domenico Cassini and by Domenico Guglielmini for the Sundial construction. Behind the tools is a press that illustrates the sundial’s route and the instruments’ use. On the next wall you see the following: a drawing by Peruzzi depicting the partial longitudinal section of the basilica according to the planned completion of a Latin cross, with a magnificent dome on the crissing transept; a painting by Annibale Carracci depicting “Christo deriso” (derided Christ). Four marble panels with biblical scenes, made around 1525 for the Basilica’s smaller doors but never started: “La moglie di Putifarre che accusa Giuseppe” (Putifarre’s wife accuses Joseph) and “la Castità di Giuseppe” (Joseph’s chastity) by Properzia de’ Rossi , “La costruzione dell’Arca” (the Arch’s construction) and “Il seppellimento di Abramo” (Abraham burrial), which according to the most recent assignments, they may also be attributable to the same sculptor, but on Tribolo’s models. Finally, two wooden and stucco models made by Floriano Ambrosini in 1592, related to the debated question of the vault’s height of the main nave. Above the door there is a marble bust of the mid-sixteenth century, depicting the Count Filippo Pepoli or his son Giovanni, both of whom covered the role of President of St. Petronio’s Fabbriceria between 1511 and 1585. Attributed to Giulio Romano are two drawings of the facade of the basilica where, with great graphic virtuosity are traced decorative details and fittings of the frontal part and sides. Between the two drawings there is the marble statue of St. Procolo that Alfonso Lombardi left unfinished at his death (537). the part he made are the head and bust, obviously inspirerd by Michelangelo’s style. 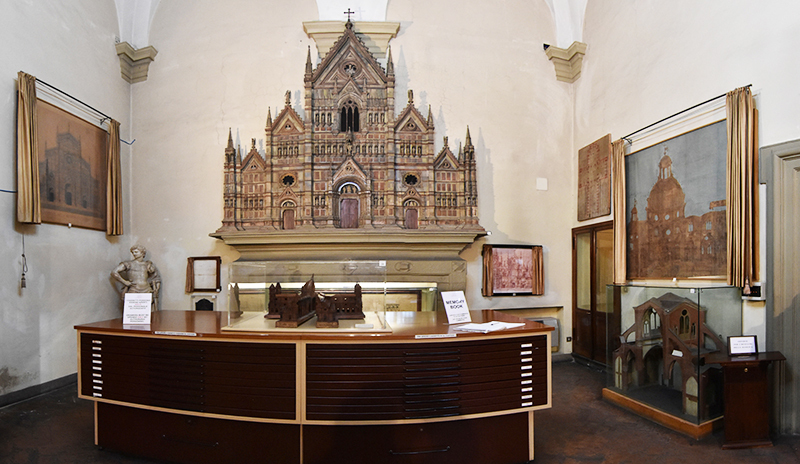 At the center of the room is a wooden model of the basilica created by Arduino Ariguzzi in the early 1500. The first showcase on the left shows vestments of the seventeenth and eighteenth centuries. Note the humeral veil in white silk embroidered with tendrills and flowers, on the first half of the eighteenth century and the processional umbrella embroidered, at the end of the XVII. In the second showcase, particularly valuable for its hand-crafting quality, is the reliquary of St. Antonio di Padova coming from Cospi’s chapel (1668). 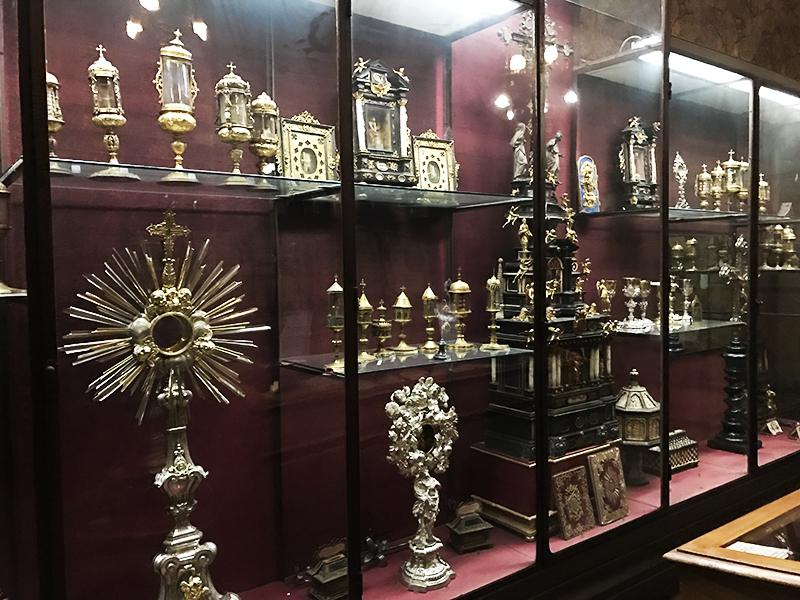 Around 1622 Pope Gregorio XV donated to the church of San Francesco in a large ebony reliquary, semiprecious stones, silver ornaments and statues in gilded bronze where it is possible to observe a series of chalices of seventeenth-eighteenth century. In the third showcase, besides the reliquaries are some illuminated choir books: the biggest ones were decorated in 1509-1511 by Giovan Battista Cavalletti with scenes from San Petronio’s life, the other three were decorated between 1447 and 1480 by Martino da Modena, but two of these contain some miniatures of the famous Taddeo Crivelli. Beside the window there is the Easter candle’s candelabrum in forged brass, a work of the first half of the fifteenth century. The walls of the room are coated with impressed leather, painted in silver and gold, of the seventeenth century. Above the door there is a tapestry fragment of the sixteenth century with the half figure of San Petronio that sustains the city of Bologna. On the first floor is the Fabbriceria’s office divided in a hall and two rooms with wooden ceilings and wall paintings by Giulio Cesare Felini and completed by Francesco Quaini; particularly notable is the frieze of the main hall with the facts of San Petronio’s life. The rooms, besides many ancient furniture preseve: radiant crucifix on the table of the fifteenth century, Madonna with Child and St. Caterina of the seventeenth, the “Addolorata” and “Cristo deposto” attributed to Pietro Fancelli, 1785. 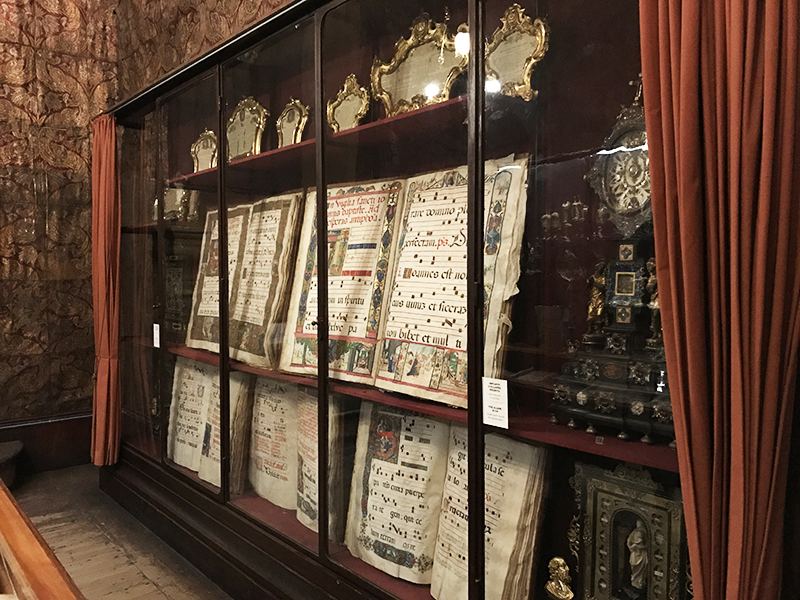 In the main hall is preserved the archive of St. Petronio’s Musical Chapel, collection of printed books and manuscripts of the XVI-XIX centuries. 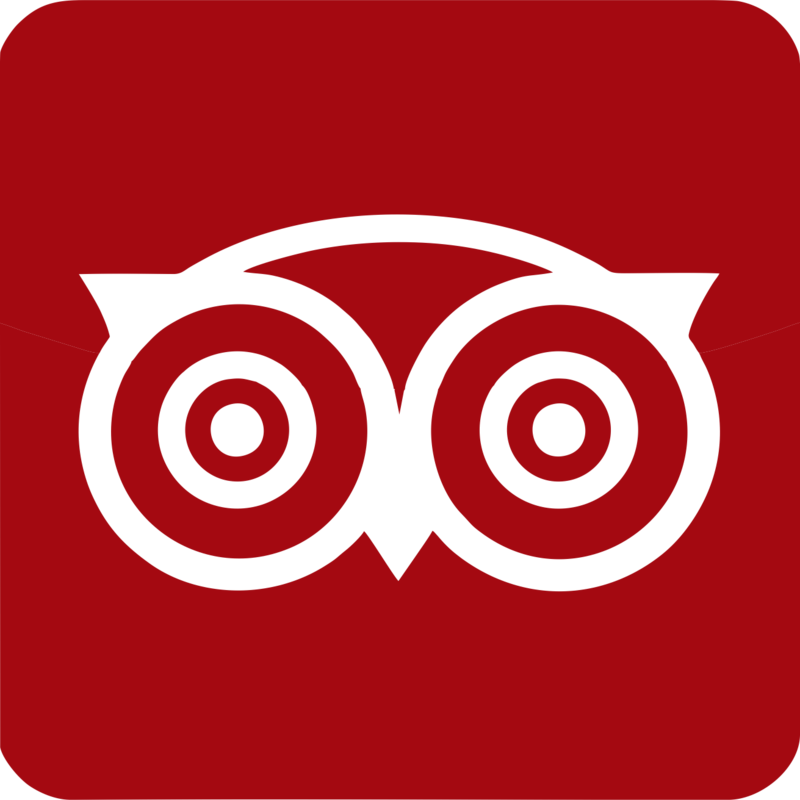 On the second floor there is the Historical Archive of the Fabbriceria, historical documents from the fourteenth century. There are also several paintings, including two stone tablets by Simone dei Crucifissi, a basilica’s plant attributable to Arduino Ariguzzi and some fragments of frescoes.